There seems to be an ongoing debate over whether Amazon reviews can actually help or hurt a book’s sales. I lean towards yes, they can affect the sales because I have at times based my own decisions to purchase a book on the reviews. I am fully aware that some 5 star reviews are written by friends or family who may not have even read the book, while sometimes 1 star reviews are driven by a personal vendetta against the author rather than the book’s actual content (this happened to a friend of mine). However, I think it’s usually pretty easy to wade through the muck and pick out the legitimate reviews from people who are taking the time to write something that is constructive and helpful. Apparently reviews on Amazon may also work into some algorithm that causes the book to show up as “recommended reading,” though I am not sure if anyone has been able to prove it. I have to admit that when I was writing the Ann Dvorak book, I obsessively read Amazon reviews of other film bios trying to get a sense of what readers were expecting from a film biography. I’m not really sure if it actually guided my writing or just made me paranoid about receiving lousy reviews, but it was always an entertaining experience. As an author, the other nice thing about Amazon reviews is being able to get feedback (hopefully positive) from readers who I do not interact with and who may not have a platform like a blog to express their opinion of a work. After working on Ann Dvorak: Hollywood’s Forgotten Rebel for well over a decade, it’s important for me to know if the book has truly filled the information void about the Divine Miz D. I am also inclined to think there are people out there who may be on the fence about reading a bio of someone as obscure as Ann, so the reviews might actually be a push. So, if you’ve gotten through the book and enjoyed it, please consider taking a few minutes to contribute a review to Amazon. It doesn’t need to be more than a few sentences stating why it’s worth reading, and certainly does not need to provide a rehash of her life and career. 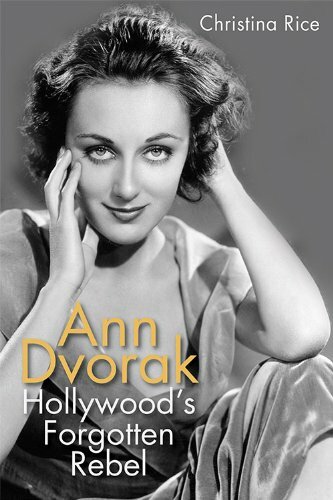 And remember, if Ann Dvorak: Hollywood’s Forgotten Rebel is a book you would recommend to other film fans, a 5 or 4 star review is appropriate.